Fundraising efforts by the Clifford Bowey School Foundation are currently being directed towards building a Safety Village. The Safety Village will be used to teach our students about road safety, and promote physical exercise. The Safety Village will be located at a currently vacant field next to the school. The field measures 180 ft x 150 ft. The Safety Village will be open to the public outside of school hours, allowing it to be used for other safety and fitness programs and activities. The Safety Village will include paved paths with turns and an intersection. Curbs and ramps will be incorporated in the design as well. Basic structures will be installed to replicate common buildings such as stores, restaurants, houses, and school. Common street signage such as traffic lights, stop signs, pedestrian crossings, railway crossings and a bus stop will also be featured. A perimeter fence will be installed for student safety. The Safety Village will provide our students the opportunity to learn and practice street safety on a daily basis. They will become more familiar with common street signs and what they mean. They will learn how to safely cross a street, how to wait for a bus, how to manage curbs and sidewalks, how to bike safely along a street, how to give and follow directions, and many other essential skills. Through this learning, our students will be safer as they navigate through their neighbourhoods, work placements, and other outside activities. Along with safety, the Safety Village will promote physical exercise as the students will be able to ride adapted trikes along the paths in addition to walking or jogging. There will be many opportunities for students to practice social and behavioural skills as well. 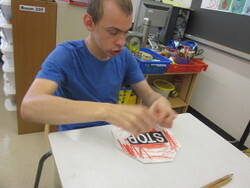 A student getting familiar with the Stop sign through classroom work. A student learning to observe a street light in the school gym. During school hours, the Safety Village will be available not only to Clifford Bowey students, but to students from other schools who may use it for safety programming as well. Outside of school hours, the Safety Village will be open to the public. Local organisations will be able to run street safety programs, including summer programs, on the property. It will also be available for use as a fitness trail to the general public. The Clifford Bowey School Foundation is currently directing all fundraising efforts towards the Safety Village. All support for these efforts is tremendously appreciated. A student riding an adapted trike.